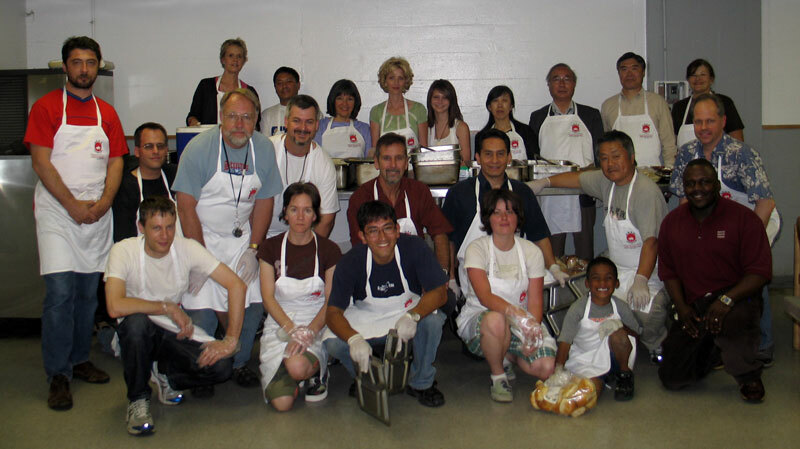 Domo Japanese Country Foods Restaurant June News! 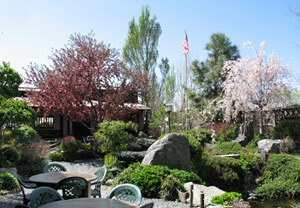 Domo’s famous award winning patio dining is now open for lunch, dinner and special parties! 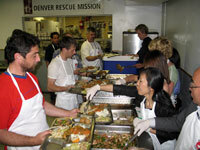 Domo Restaurant recognized for 50,000 meals served at Denver Rescue Mission. Domo was recognized on May 18th, 2008 for serving 50,000 meals and for 18 years of consecutive service at the Denver Rescue Mission in downtown Denver. 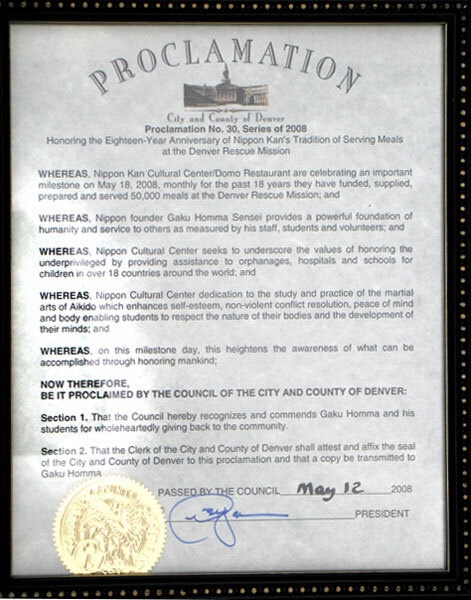 The Consul General of Japan, Kazuaki Kubo and Consul Yamagami from the Japanese Consulate, Councilwoman Judy Montero and staff from District 9, Denver Rescue Mission Volunteer Coordinator Staff and Nippon Kan Volunteers were all on hand on Sunday the 18th of May to recognize Domo owner and Head Chef (Also Nippon Kan Culture Center Founder) Gaku Homma with an awards recognition presentation. 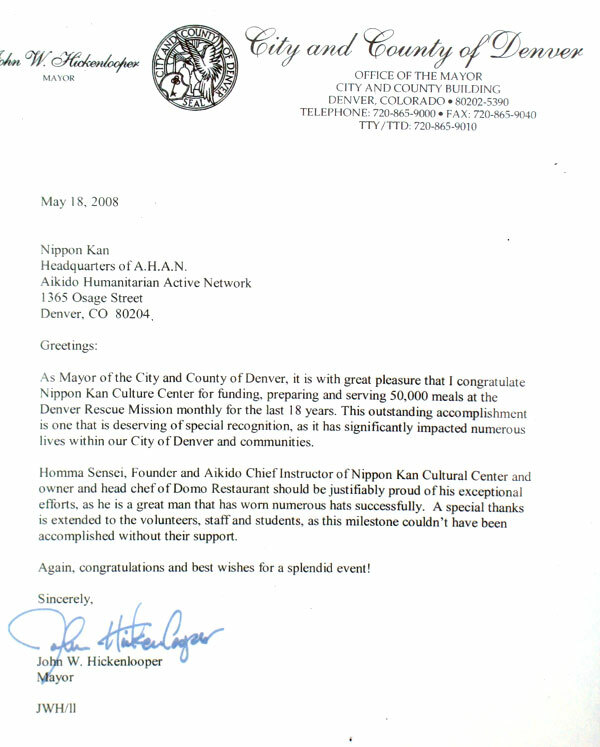 Mr. Homma, Domo Restaurant and Nippon Kan Culture Center were all recognized with a formal Proclamation by City Council on May 12th, 2008 with letters of recognition from the Governor of Colorado, Bill Ritter and the Mayor of Denver, John Hickenlooper. 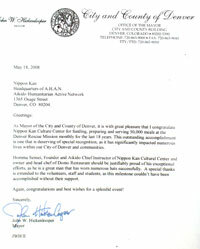 Congratulations on a job well done! 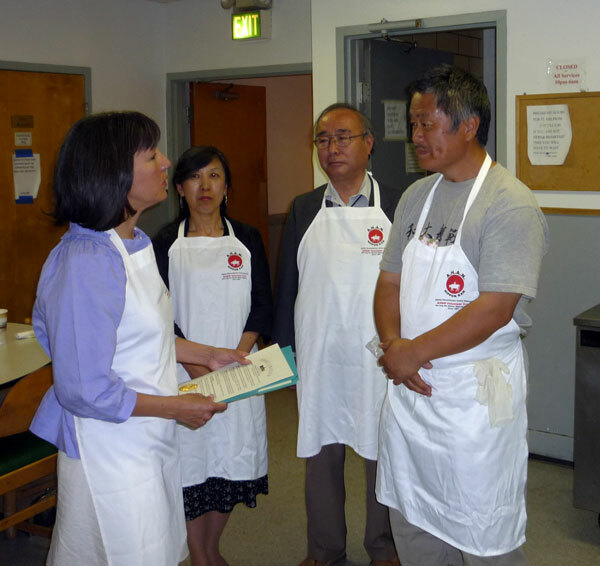 General Consul Kubo serves the 50,000th meal! 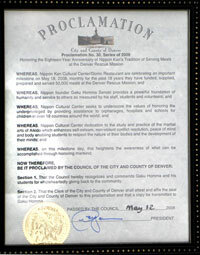 City Proclamation to Homma Kancho. Back row: Consul General of Japan Kubo & his wife. In support of children around the world, AHAN is selling exotic teas that were hand-selected by Homma Kancho and delivered directly to Domo Restaurant for the summer season. 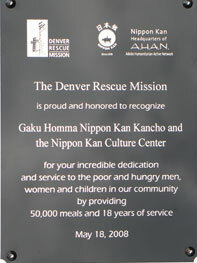 For more information on AHAN Humanitarian Projects world- wide visit the Nippon Kan website at www.nippon-kan.org. Click here for more information on these wonderful teas. Enjoy Domo's Summer Sake – served chilled! Click here for more information. Chef’s recommendation at Domo for June is our unique Battara Yaki appetizer. Made with flour, egg, flaked maguro tuna and salmon, scallion, onion, lettuce and carrot, topped with seaweed and tempura sprinkles, Domo Battara Sauce and served with a side of Japanese mayonnaise and red pickled ginger. At Domo, battara yaki was introduced on our appetizer menu last year and has become a popular favorite. Whole Spanish mackerel, breadcrumb flour, egg, salt, pepper cooked in premier vegetable oil. Topped with shredded cabbage and original sauce made from soy sauce, tomato, apples and spices. 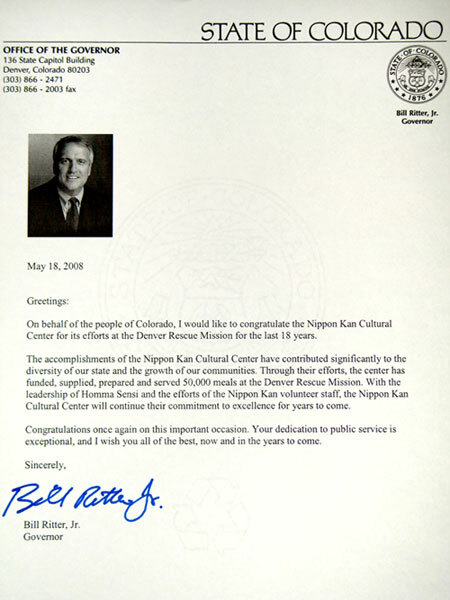 Served with brown or white rice with barley, miso soup and three Domo Country Side Dishes. Most popular of the blue fish in Japan is the Sanma or Mackerel. Sanma is not only popular in Japan, it is popular in many Nordic and Mediterranean countries as well. Domo will feature Sanma as its May Lunch Special. Sanma is high in both DHA and EPA fish oils, and is known to be good for high blood pressure, clogged arteries, and lowering high cholesterol. Sanma is also high in vitamin A which is good for your skin and eyes, B12 which is know to be good for anemia and the skin of the Sanma contains a high amount of B2 which helps to metabolize fats into energy. For all of these health reasons, Domo uses the whole Samna in this delicious and healthful dish, lightly fried in the best vegetable oils to make it always crisp never oily. 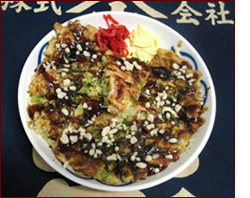 Sanma is traditionally garnished with shredded cabbage in Japan which serves not only as a culinary compliment but as a digestive aid as well. 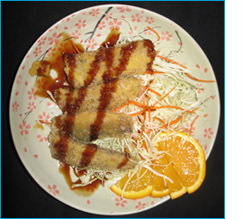 The Sanma is topped with Domo’s special home-made sauce and a dab of Japanese mustard. The Sanma served at Domo may contain very small bones after it has been cooked, but these are completely edible and a good source of calcium! During the current Sushi BOOM, the population of some fish like Maguro tuna, Unagi and clam have become depleted to the point of endangerment. At Domo Restaurant we are doing our small part in world-wide resource environmental management by focusing on fish with more plentiful resources like the healthy and delicious Sanma. We hope you enjoy this delightful new addition to the Domo Lunch Menu!